So my recent Thanksgiving vacay got me to thinking. Who wants to be that unfortunate looking bag lady walking through the airport looking as though you may curl up and nap right next to the boarding pass kiosk? Nobody! So with these tips hopefully you’ll be bale to travel in fine fashion and arrive to your destination looking nothing less than fabulous. Don’t: Bring a purse and a huge tote bag, consolidate. Unless your purse is a small cross body that only has room enough for keys, wallet, and gloss then try to fit everything all into one. You choose: tote, big purse, or backpack. And if you happen to chose all three, don’t be surprised if someone follows you around singing in the key of Erykah. A good chunky infinity scarf is my preference. It’ll add style to whatever you’ve got hiding under your coat and can double as a pillow on the plane. Even if you’re heading somewhere warm, a lighter cotton scarf provides the same functionality. I’m happy for you and your Louboutins. I really am. However, your five hour flight across these United States is not really the time to stunt on us. Save that for your destination. I say stylish but comfortable booties or neutral sneakers are your best bet. With the TSA laws now you’ll also want something that’s easy to take off and on quickly. Though fitting the profile, flip-flops are a no-no too. If there’s a security issue and you need to run away quickly you’ll be cursing your Havianas from here to Timbuktu. After sitting in my fair share of airports, buses, and planes, I’ve learned the importance of this. 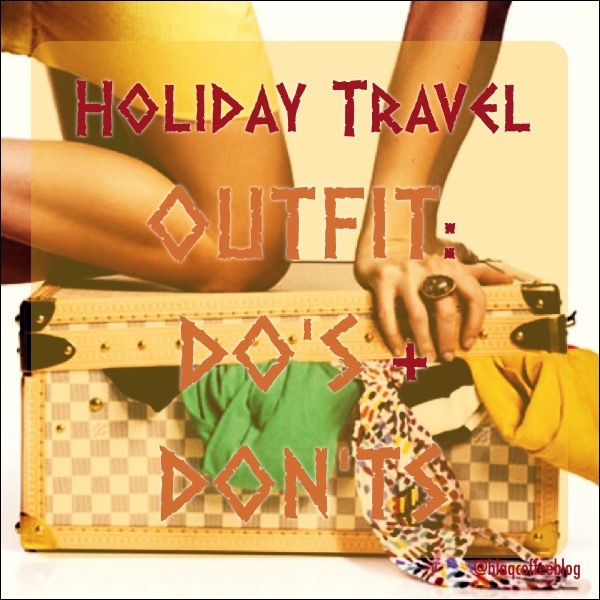 Dressing in layers will allow you to take off when necessary and have the option to put it back on later. I like a tank or cami, then with a long or short sleeved tee, next a cardigan topped off with a good pea or trench coat. I’ve found that temperatures can fluctuate causing you to go from freezing to sweating in a matter of seconds but this combo should do the trick. Don’t: Forget a hair tie! Your free flowing strands or curly fro may seem like a great idea when you leave the house. However, by the time you’re trying to get comfortable with that C-shaped travel pillow they may start to tangle and get in the way so keep one of these babies handy. Do: Bring sunglasses or hat! These accessories seem simple but can add lots of depth to your outfit once you land. Face it, hats just make you look cooler. Sunglasses too. So pick one…or both, and throw them in your carry on. You’ll thank me later. These may seem like simple tips, but if you’re any sort of a procrastinator like myself, then maybe this short list will help you make the most of those last 24 hours before you travel.